I was hopeful that once the election was over, the barrage of fake news sites and sensational headlines in my social media feeds would just…go away. The rise of fake sites, overly-sensational political “news” pages, and questionable sources have caused some to speculate on the influence this garbage had on the outcome of the election. According to a 2016 Pew study, 44% of American adults get their news from Facebook. Yikes! Facebook, Google, and others are exploring how to put a stop to the fakery, but as so much of it is tied to advertising (the more that people click a sensational headline, the more the site makes), it’s doubtful that any real change will happen. One professor has gone so far as to create a chart of fake news sites, but she came under fire almost immediately for including political opinion blogs in with actual fake news. The real solution is for all of us to become smarter consumers of information. For library media specialists, these are the kinds of critical-thinking skills we try to teach (and help teachers teach) every day, and many are working overtime to address this growing inability to make good media judgments. 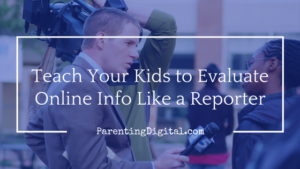 A few years ago, I started teaching younger students a simple way of asking the right questions whenever they are looking at a source of information, especially online. 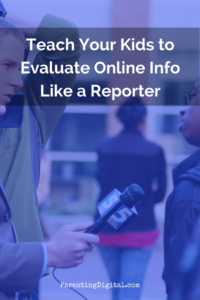 In college, I worked for the school newspaper and relied heavily on the “reporter’s questions”, the 5 W’s and an H. Who, What, Where, When, Why, and How. Kids need to start questioning who is behind the information. What individual or organization wrote or produced the site or page? Is there a name anywhere? The easiest way to do this is to look for an “About” page. If someone is not willing to state who they are, ignore the info and move to the next search result. Within the article or page itself, who are the sources of the information? Are people being quoted directly, or is the writer just saying that the person “once said” something? For example, a person’s name may be mentioned, but none of the person’s actual words are used. Does the information seem reliable and valid? Obviously, our gut can be very wrong about this, especially when we are younger. Fortunately, there are a few ways to test this. Are there direct quotes in the text? Copy one complete quote, put it in a Google search (with quotes around it), and see if that quote shows up in other reliable sources. Do the same with facts and statistics. Can you find the exact same facts reported in other reliable media (“mainstream” news sites, like NBC, CNN, FoxNews, etc.). The fancy word for this testing is corroboration. Is the story or information complete? An article with just a couple vague, undeveloped paragraphs is usually a red flag that someone simply copied and pasted a few sentences from somewhere else…or made it up in a hurry. Is the information presented as fact or as an opinion? Look for key opinion words like should, might, I think, I believe, always, never, and emotional words like awesome, horrible, wonderful, and great. Just because it is an opinion, by the way, doesn’t mean we should throw it out. It’s just critical that our kids learn to recognize the difference between factual reporting and someone expressing opinions. Looking for a copyright date on the page is unreliable, by the way. It only tells you when the site was last updated, if that. Look for a date on the article or post itself. Sometimes, sites don’t include dates, making this mystery more difficult to solve. Another important, though more technical, question to ask: where does this information “live”? This is where you can teach your kids about looking at the URL, or website address, itself for some clues. Look at the first part of the address. The “www.something.com” Does the name of the site match the type of information you are looking for? For a simple example: if you are reading this post in a browser right now, look at the URL. The beginning of the address is “parentingdigital.com.” Regardless of what comes after the forward-slash, you could go to the parent site (no pun intended) and see what it’s all about. Look at the end of that first part (before the first forward-slash.) .com and .net don’t tell us much. Neither does .org anymore, though it often is associated with non-profit organizations. .edu is a school or university site. .gov is an agency or department of the federal or state government. These last two are the most trustworthy because of the organizations that are running the sites. Look for weird endings (.lo or .com.co). These are often fake or scammy sites. This is a tough one for younger kids, but it starts to teach them concepts like purpose and bias. Why do you think this person or organization is putting this information online? What are they trying to get out of it? Are they trying to sell us something, or convince us of something? Are they just doing it for entertainment? Warning, parents: This one is the area where they need the most coaching. It doesn’t come naturally for kids to question someone’s motives. And while we don’t want them to distrust everything they find online, a healthy dose of skepticism will do them good in a world of sometimes shady information. When it comes to how the information is presented, how it is structured, and how the writer uses the information (or misuses it), we need to look for a few more red flags. Is the headline overly sensational or dramatic? Sure, writers have always had to compete to get an audience’s attention, but headlines that “trick” the reader into clicking (called “Clickbait”) are deceptive. They usually play off of fear, anger, or other emotions and exaggerate the truth behind the “article” itself. Look for trigger words and phrases like shocking, just revealed, and won’t believe. Does the story match the headline? If the headline claimed that a pop star “just revealed” some juicy secret, is that secret even in the story? If the headline screams that you “won’t believe” the “shocking” information about some new law that was just passed, is there even any factual evidence that a law was proposed and enacted, or is it just a story based on an off-the-cuff remark that some senator’s assistant mentioned in passing? Is the text surrounded by ads? Do ads interrupt the text? Is there more ad content on the page than the actual content? This excess is often a characteristic of fake sites. Money is made by the site owner on what’s known as CPM, cost per thousand viewers. We don’t even have to click the ads, sometimes, for the site to make money. You just have to show up. How long is the article or information? While there is the occasional “news short,” most news articles and well-developed opinion pieces are lengthy. There are details, quoted sources, facts and statistics. If the text is shorter than 300 words or so, it may not be “meaty” enough to be worthwhile. While the “5 W’s and an H” simplify the questioning and critical-thinking process of evaluating information, this is far from easy for kids. The ability to examine all these characteristics all at once is a practiced skill, learned over time and with experience.